When I was growing up, my mom was a caterer. She wasn’t a big time caterer with a staff milling around, but, rather, she whisked under the radar and catered mostly church and church-related functions, functions like the annual pastor’s conference, weddings, and banquets. Without a license, she couldn’t do much else and getting a license in Georgia is pretty rough–you can’t cook in your house, so she made do with word-of-mouth advertising. Luckily for us, while churches don’t tend to pay all that well, it kept us fed. Every catering event meant leftovers and, let me tell you, while I hated a few dishes (waldorf salad? That jello stuff with fruit in it? Cream cheese squares with raw broccoli on top? OhmygoshNO), I mostly dug the food. Fact: evangelical pastors love beer cheese soup and casseroles. Yup, beer cheese soup (you didn’t read that wrong–I guess they wouldn’t drink beer but they’d slurp it up in soup?). And, for the record, I’m down with those things too. One of my favorite casseroles was her Taco Pie, that super unauthentic “Mexican” casserole that every midwestern household has a recipe for–you know, meat + cheese + salsa = Mexican food, right? But her’s was the best–what other mother made a Mexican casserole with a crescent roll crust? What other mother used only one brand of taco seasoning to achieve the perfect semi-(ok, not-spicy-at-all)-spicy south-of-the-border flair? And what mother routinely made such a dish for hundreds of other people, ensuring that the ends and the corners were always left over for me? Heaven, that casserole was heaven. And I’ve always wanted to veganize it. For almost five years now I’ve wanted to veganize it and I never have. Until now. Now I’m down to my last slice and weeping over the thought of it being gone (yet, alternately, stoked that it’ll go to lunch with me tomorrow). It’s such a simple dish that making it didn’t feel like “cooking” to me, but with everything going on with the house, casseroles and soup are the best things–large quantities, lots of leftovers for lunches and dinners, and easy one-dish storage in the fridge. Subbing Trader Joe’s soy chorizo for the meat, Daiya for the cheese and adding some beans and corn make the casserole a wee bit different than my mother’s recipe, but I think I could trick even the pastors with it. It’s cheesey and like a huge burrito, but with a crescent roll crust. And that’s all I really need in my life, that crescent roll crust. Next, layer the soy chorizo on top of the chips, then the corn and beans. Spread the salsa on top with a spatula and then spread the vegan sour cream over the salsa. Top with the Daiya and bake for 40-45 minutes until the Daiya is bubbly and the visible crust is brown. Ooh I would eat that…especially with the crescent roll crust!! Interesting dish – I’m not crazy about using imitation meat products but this makes me want to do something similar with beans, and maybe tortillas. Like a Mexican lasagna! I’m not sure what crescent rolls are, gonna have to google it, but this looks awesome!! I remember crescent rolls from when I was a kid. How very creative of your mom to use it as a crust! The taco pie sounds and looks delicious! 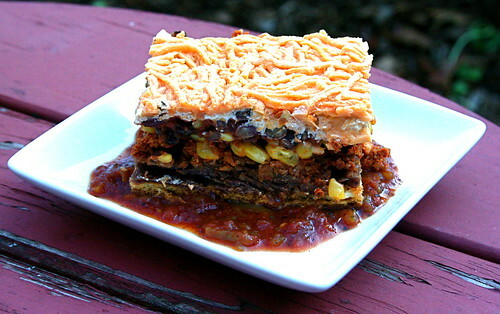 Though casseroles generally make me cringe, I would make an exception for your taco pie. Anything with both corn chips and Daiya has got to be good! For what it’s worth, I agree with you on the misconceptions surrounding the bi-party system. I also think many of people in power start out well intentioned (not ALL) and become overwhelmed by the bureaucracy and pressure.